The black PHX-3055Z-CE-G95 30 to 55° Phoenix Zoom Ellipsoidal Light from Altman has been designed and engineered with a number of details and features enhancing versatility and efficiency without sacrificing performance. This unit is a fully functional, stylish, and efficient luminaire. To broaden the capabilities of the fixture, it comes with a GLA lamp. A 360° rotating barrel helps keep the artistic part of your fixture’s focus intact and easy to attain. Also, with virtually no light leak from the fixture itself, you won’t have to worry about any extra light illuminating unwanted parts of the ceiling. The aesthetic appearance and ergonomically designed function controls only add to the appeal. 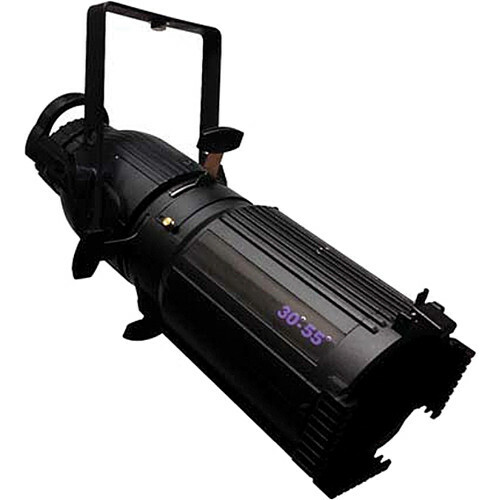 All of these innovative options make the Phoenix Zoom Ellipsoidal Lighting suitable for theaters, long throw venues such as opera houses, or wherever energy-efficient lighting performance is required.